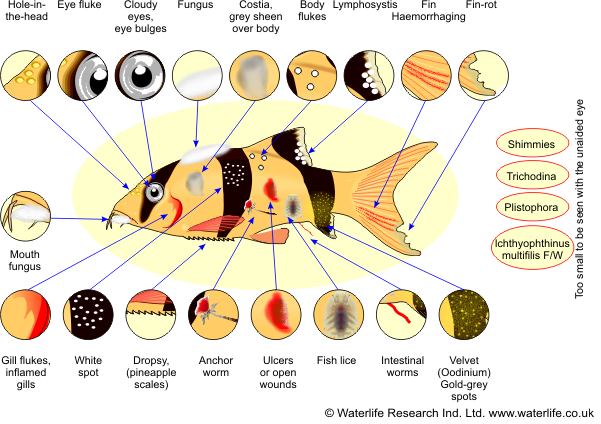 The following chart of Tropical Fish Diseases has been designed to help you diagnose fish illnesses and we have added links to waterlife products that will help treat the problem. Please be aware that nearly all fish diseases are a symptom and you must correct the cause of the problem. This usually means correcting poor water quality, but other causes such as over crowding or aggressive fish are also causes of fish disease. List of tropical aquarium fish diseases and recommmended waterlife treatment. Kettering Koi & Ponds Ltd. offer this guide and chart as a diagnosis tool for aquarium fish diseases. It is shown to aid customers in this area. We do not accept any liability for loss and cannot guarantee sucessfull treatment. If you need further assistance we advise you contact a veteriniarian.